Okay, let's take a step back and examine what's happening here. Omni Verse, this video's creator, has taken the entire movie and broken it into 60-second chunks (as closely as possible; the credits end a little early on the last bit). 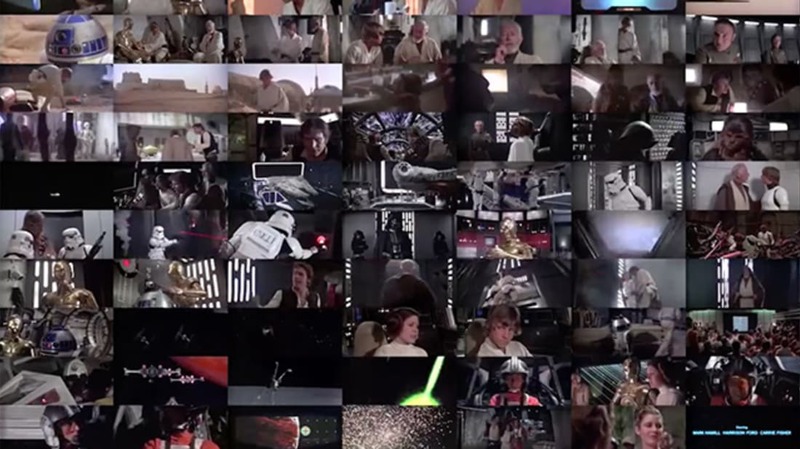 Then all those chunks play simultaneously on a giant grid, giving us an odd overview of the movie. I admit, at first this seems insane (particularly the sound—muting it makes the thing less maddening), but if you make the video fullscreen and HD, you can actually pick out a lot of patterns. For instance, notice all the shots of Luke's face, particularly in the beginning and end; also notice how Obi Wan appears, gets a ton of face time, and (mostly) disappears. Another obvious one is the use of color and environment; when we're on Tatooine in the beginning, the film has a distinct look—blue, purple, sand, earth tones. But for the rest of it, we're in a very black-heavy space environment. Neat, right?